The bloodworm is an imitation of the larval stage of the Chironomid midge or buzzer. Bloodworm spend the majority of their time living in a silty tube. When disturbed they move their bodies from side to side which is where the mobility of this patterns spanflex legs come into the equation. 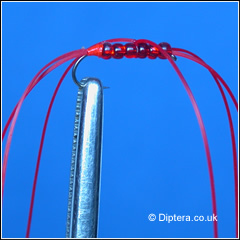 This is one of the best bloodworm patterns you will find and can be fished throughout the year, not just throughout the winter. For some reason Olive Beaded Apps Bloodworms seem to work well when snails are visible on the water. This fly is great in different colours, olive, white and pink being my personal favourites, the fish tend to switch off red bloodworms at times and need somthing else to entice them. 1.) Floating Line - long leader using a dead drift, let the wind take the fly around. Occasionally use a very long pull of the fly line to pull the fly up a few feet and then let it sink back down again. 2.) Floating Line under a bung, Let the feet drift around in depths of less than 6 feet near banks. 3.) Intermediate - Can be awsome fishing this method, use variable rates of retrive from a slow figure of eight twitch right through to the fastest pull you can achieve.